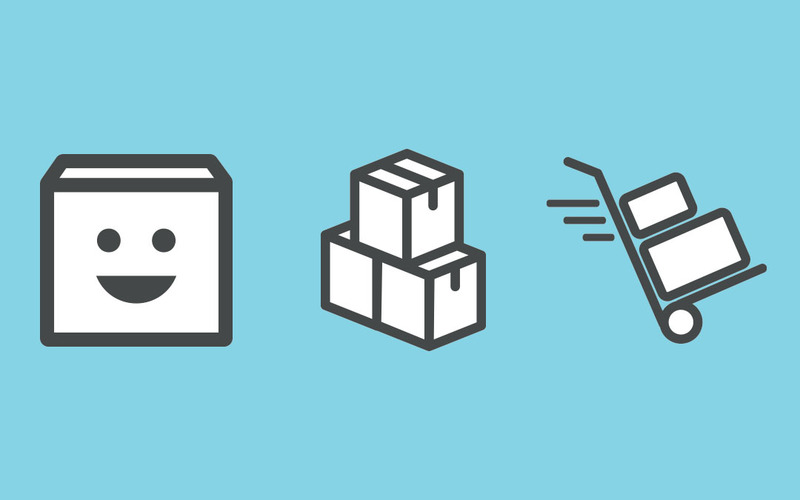 How do you know that you’ve created the right e-commerce packaging strategy? Even with how big the e-commerce industry is, and how many different types of businesses are taking advantage of it, your packaging strategy can still feel like guesswork. Thankfully, this type of industry tends to have rapid results (was the box damaged? were shipping charges more than expected?) and quick feedback (are your customers happy? ), allowing you to alter your packaging choices faster than ever. Whether your business is just starting out, or you’re an established operation looking to truly target and refine what it’s doing, we’ve got a strategy rundown just for you. Here’s the 3 points of an e-commerce packaging strategy that you’ll want to keep in mind while developing yours. Think like a customer. What do they want? They want their product quickly, they want it undamaged, and they want to be entertained. Customer #1 receives a dented box with a damaged product inside, while Customer #2 receives an intact delivery and opens it up to find branded packaging, a thank-you card and an undamaged product waiting for them. Who’s more likely to become the repeat customer? When planning your e-commerce packaging strategy, focus on customer experience, engagement and satisfaction. Use high-quality packaging materials for the best in product protection. Be sure to fully pad and secure a product inside its shipping container. And, if you’ve got the budget for it, invest in an unboxing experience. Branded packaging like custom colour boxes, custom tissue paper or even just custom printed packing tape all make a big show of your shipments. Your customers will appreciate it, guaranteed. No matter what you choose to do, don’t forget the thank-you card! Any damage your shipments suffer will reflect poorly on you, not the delivery service. When planning your e-commerce packaging strategy, you’ll also need to focus on packaging performance, quality and effectiveness. The unfortunate truth is that you have no control over how a delivery service treats your shipments. What you can control is how well you pack your customer orders. Use high-quality packaging materials and pack your products in ways that prevent them from moving around or colliding with other surfaces. Using return-friendly packaging can help augment your packaging efforts. Returns are an inevitable part of running an e-commerce business, so you’ll want to make that process as easy and reliable as possible. For example, mailer envelopes with easy-tear openings will reduce the customer’s need to rip it open, and a second peel-and-seal adhesive strip can make it exceptionally easy for them to send something back to you. No matter what you choose to do, don’t skimp on your packaging materials. From here on out, like sending a kid off to college, things are not in your hands. But you’ll still bear the costs of sending things on their way. When planning your e-commerce packaging strategy, don’t ignore shipping costs, dim weight charges and budgeting for both. The faster you want to ship something, the more you and your customer will have to pay. The more valuable an item is, the more insurance you’ll require, adding yet more to shipping costs. This can turn customers off, which then makes passing on shipping costs a delicate subject. Don’t forget to educate yourself as best you can on dimensional weight shipping charges, so you can understand how to use them to your advantage. Instead of using corrugated boxes for every item you ship, perhaps using padded mailer envelopes can help reduce costs. No matter what you choose to do, remember that each choice costs money and if not monitored carefully, can eat away at your profits quickly. It’s quite the balancing act, ensuring your e-commerce packaging satisfies your customers, protects your products and doesn’t break your budget. Thankfully, new technologies and techniques (that are cheaper and more effective than ever) are making it easier to wrangle all these points into one manageable packaging strategy. Whether you’re looking for custom branded packaging options, multi-use packaging materials or simply ways to reduce your packaging costs, The Packaging Company is here for you. After all, we’re your e-commerce partner.